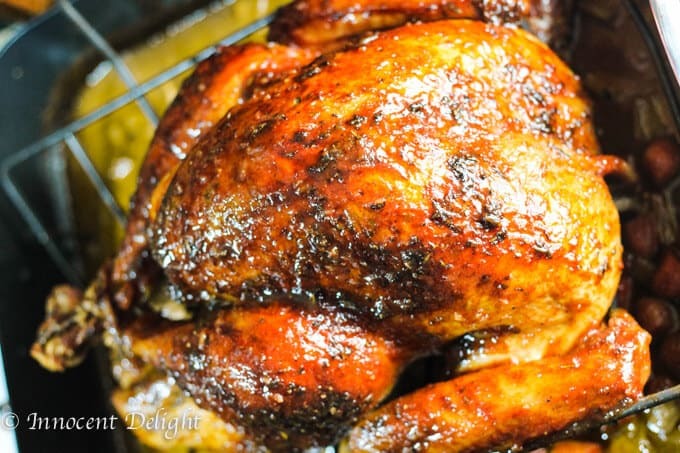 Amazing alternative to roasting the whole bird. 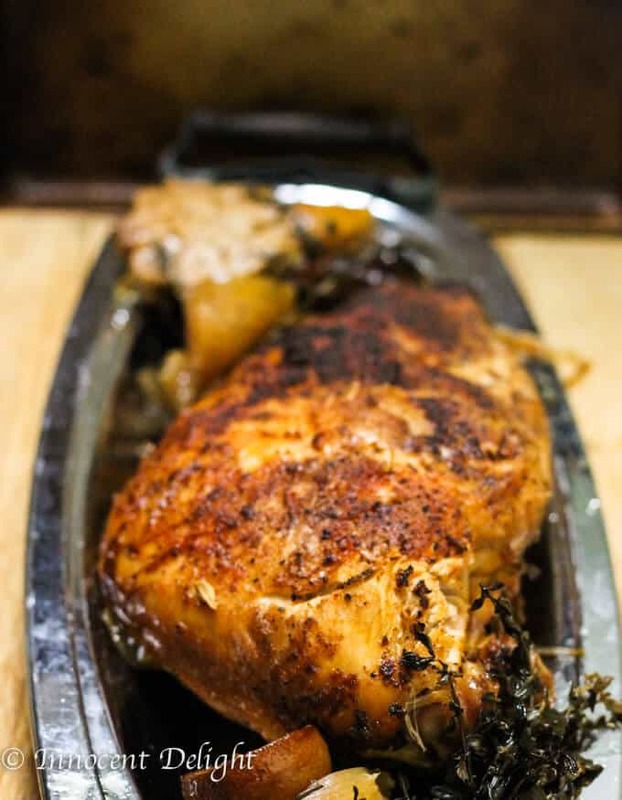 This slow cooker turkey breast is simple, delicious and takes only 5 minutes of prep time. 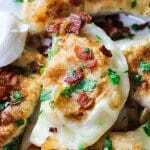 This recipe was originally posted on September 28, 2014, but it’s back by popular demand! Over the past two years I’ve received a number of questions regarding this dish from my readers. So, I figured this would probably be an opportune time to both answer these questions, and offer some fresh ideas. With Thanksgiving around the corner, many of you may be looking for an alternative bird cook. Needless to say, the slower cooker turkey breast offers an easier, more convenient option. Answer: I placed the turkey breast on top of onion, garlic, etc…; so it wasn’t swimming in juices. Additionally, I put a lot of dry rub on top and I think what made it crisp up is by leaving it for another couple of hours on a “Warm” setting before serving. Answer: Mine was about 3 pounds. I usually buy it from Trader Joe’s and they have them in a size ranges from 2.5-3 lbs. Answer: I took a whole garlic head with the skin on and cut it in the half. I then put both pieces, with the skin down, in the bottom of the crockpot. You will discard the garlic at the end. Afterwards, if you want to make a gravy, the best way is to strain the remaining sauce through a cheese cloth. Answer: I actually just sprinkled all the spices on the top of the breast. I literally prepared it in about 5 minutes before leaving for work and didn’t have time to rub it under the skin. That said, I’m pretty sure that rubbing spices under the skin will actually make this turkey even better…so by all means do it! Rub it under, and while you’re at it, sprinkle more on top. Answer: The meat does come out very tender so slicing may be actually a challenge, but you won’t have to shred it either. Rather, you’ll be able to get nice pieces of meat that just peel off the carcass. Answer: It won’t hurt. I don’t do this because I’ve done this turkey so many times and I know that onions and garlic, along with turkey itself, produces so much liquid that you won’t even want to use all of this for your gravy. But if you feel uncomfortable going this route, then feel free to add some chicken stock, wine, or water. It all will work. You will just end up with a little bit more liquid in the end, but that’s it. The flavors will still be there. Answer: Absolutely, the more veggies you add the more flavorful your gravy will be. Try adding carrots, celery and parsnip. Answer: Just add root vegetables at the bottom (carrots, parsnip, celery and potatoes). Once the turkey is cooked, strain the veggies and blend them. They can thicker your gravy. Answer: This can happen because the lemon skin can produce different tastes. It happened to me once and some of the readers gave me the same feedback. So, I’ve updated this recipe to remove the lemons. Once you’re making your gravy, you can add some lemon juice to get a little tanginess. 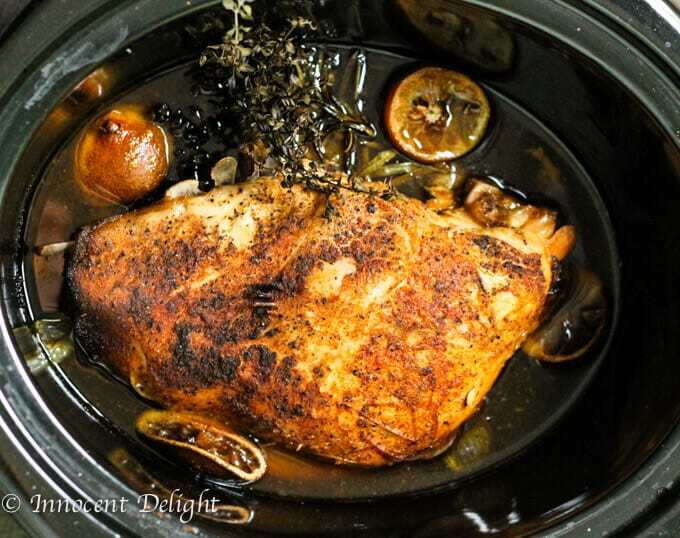 Welcome to my take on a perfectly moist and delicious Slow Cooker Turkey Breast. With this recipe you can have your favorite Thanksgiving meal any day of the week. And the best part of it is that you almost do nothing at all. The beauty here is that the slow cooker will do most of the job for you. It takes literally 5 minutes to prepare. I did this in the morning before I left for work, while preparing lunches for my family. 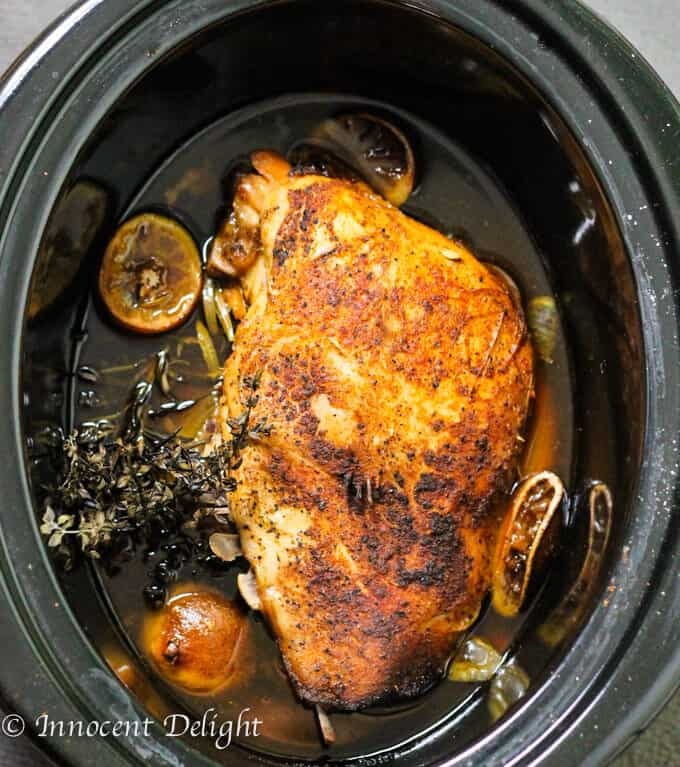 I grabbed this beautiful turkey breast from the fridge, then added garlic, onion and lemon from the pantry and a couple of herb strings from my garden, some dry spices from the cabinet and threw everything into the slow cooker. All I had to do then was set it up for 8 hours, and walk away. Concerning your spicing, I decided to go with the Tuscan flavors of lemon, thyme and rosemary; but you can actually use whatever spices and flavors you wish. It will be equally delicious. When I came returned from work that night, dinner was done! For me Thanksgiving is a fairly new tradition. Obviously, it’s not celebrated in Poland. However, I said “fairly new,” as I’ve actually been celebrating it for the last 9 years here in the States and I absolutely love it. All those foods and flavors…OMG my mount is watering now. As I write this, I actually want Thanksgiving dinner right now. To roast the whole turkey takes a lot of preparation and a lot of babysitting while in the oven, in order to make a beautiful, flavorful and moist bird. But now you can cheat and have thanksgiving dinner without the fuss. When I got home, the smell in the house was incredible. It happened that my husband worked from home that day and was teased by the smells coming from the kitchen throughout the entire day. He made sure to reprimand me when I returned. He wanted to just eat. Yet, even he conceded that the reward of having it for dinner was worth the wait. You can serve this slow cooker turkey breast with mashed potatoes or mashed sweet potatoes like these Maple Mashed Sweet Potatoes with Candid Pecans, Craisins and Chives or just as is, with it’s natural juice and bread (like this amazing Homemade Dutch Oven Crusty Bread), or you can even make a gravy from the juice. I actually chose to have a dinner with mashed potatoes and gravy. So I boiled the potatoes and once they were cooked I mashed them with milk and some sea salt. As I mentioned, I also made gravy from the turkey juice. The things that surprised me most was the amount of water that this bird produced and the amount of fat on top of that. I had to literally spoon the fat off before I made my gravy. But once I’d done that the gravy couldn’t have been easier. I just brought those juices to boil an added mixture of milk and corn starch, seasoned to taste with salt and pepper and voila! Thanksgiving dinner with mashed potatoes and turkey was done. 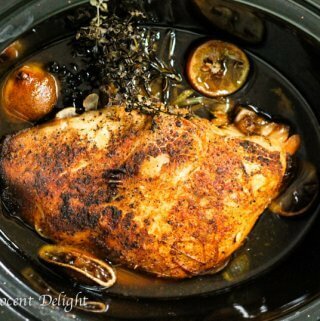 Slow Cooker Turkey Breast with simple spice rub, onions, garlic and fresh herbs is quick and easy. You only need 10 minutes of prep time to set it and forget it. Your dinner will get cooked on its own. For extra crispy skin, broil for 3-4 minutes. Once the turkey is done, you can take it out along with all the veggies and herbs. Now you can also add lemon juice for some extra flavor (See note 2 below). 1. 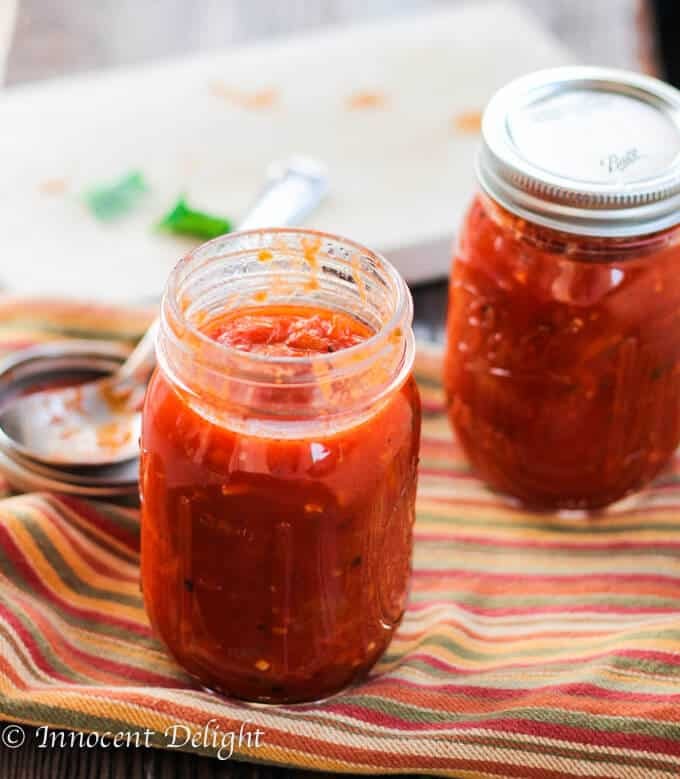 Depending on how much sauce you have, you may need to add more milk/cornstarch mixture. Just add 1/2 milk with 1 tablespoon first and see how it thickens up. If needed, repeat the process. 2. Originally I posted this recipe with the lemons added to the crockpot. It happens that the sauce can get a little bitter from the lemons. I guess it depends on the lemons. I suggest to skip the lemon and adjust tanginess of the gravy at the end with some lemon juice. This looks amazing. Question though, how did you get the skin to crisp up like in the photo? Did that happen naturally in the slow cooker or did you place it under a broiler for a few minutes? About how many pounds was the turkey breast? Hi Jan, mine was about 3 pounds. I usually buy it in Trader Joe’s and they have them in as size from 2,5 -3 pounds. I hope that helps. Hi Jordyn, I did not put it under the broiler. Zee on another comment asked me the same question :). I place the turkey breast on top of onion, garlic, lemon etc, so it was not swimming in juices. I put a lot of dry rub on top and I think what made it crisp up is leaving it for another couple of hours on “Warm”. It only happened because I set it up before I left for work around 8 am and we ate it around 8 pm. I made this dish couple of times before but never left it on “Warm” for so long. I think that’s why it got so crisped up. I was actually scared that the meat can be dry but it was super juicy. Good Luck! Depending on your hour of dinner, plan ahead and give yourself couple more hours to just keep this turkey on “Warm”. 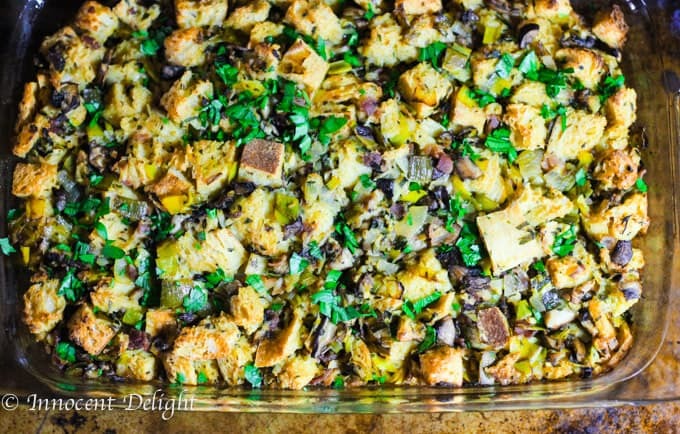 I’ve added this to my Thanksgiving menu – thank you! How big was the turkey breast that you used? I was thinking about using a meat thermometer as well, but I want to make sure I time the rest of the meal right for the weight. Hi Lauren, mine was about 3 pounds. You can use thermometer and double check if it’s cooked. I usually set up mine in the morning and then eat it for dinner, so it stays on warm for a couple of hours. So I have never situation that it was not cooked through. Thanks for the response! I can’t wait to try this. Not sure if this is a dumb question or not…but when you said to cut the garlic head in half, do both halves go in there and do you leave the garlic skin on? I will be making this for my son and I on Thanksgiving, as it’ll just be the two of us. And I would like to be prepared. I hope mine comes out as wonderful as yours! Sounds so yummy and cannot wait to try it! Hi Melinda, thanks for checking my recipe. I took whole garlic head with the skin and cut it in the half and put both pieces and the bottom of the crockpot.You will discard the garlic at the end and if you want to make the gravy, the best way is to strain the sauce through cheese clothes. I just sent a comment about the garlic head, if we are to take the skin off of each clove or to leave the entire head together, (skin included), and cut in half. And if we are to put both halves in. Now my next question is, when you said a large bone in turkey breast, how many pounds did you use? I just bought about 6.5 pounds. 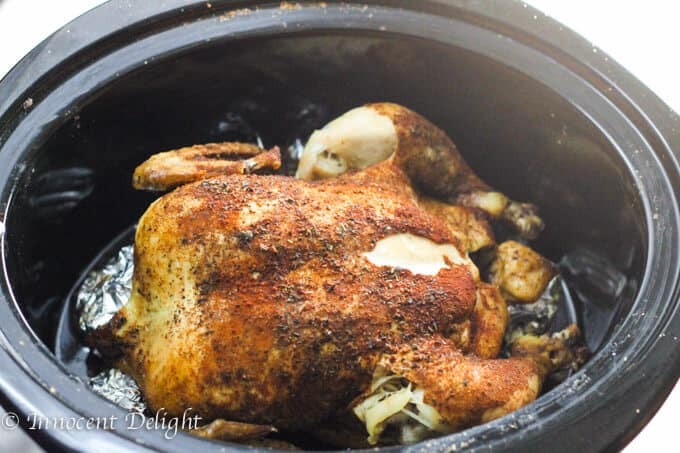 Will the crockpot at low for 8 hours, cook the turkey thoroughly? Just wanted to make sure before I cook this the night before thanksgiving. I would hate to cook it and then to find out it is too large to cook in the crockpot, lol! Again, thanks in advance for all your help! Take care and talk to you soon! Melinda, do you have two breast together? This seems pretty big. Mine was not more than 3 pounds. I usually buy it in Trader’s Joes and their size is between 2,5 -3 pounds. I’m not sure if the big one like yours fit in your crockpot. Why don’t you try to put it in and see of it fits. If it does I would suggest you cook your turkey on high for 4 hours and then check the temperature. It needs to read 165 in the middle of the breast. If it does, then it’s cooked. You can easily leave it on warm for another 2 hours and let it crisp up on the top. I hope it helps. I thought that maybe the 6.5 pounds may have been too big…I couldn’t tell in your picture how big the one you have cooked. I have a pretty big crockpot and I actually bought the turkey after I sent you the message, but before you responded. So I took your suggestion to see if it will fit in there and it looks like it does, whew! I was nervous there for a minute, haha! I did try to find a smaller one but they were all pretty much two breast. So I got the smallest one I found. Besides, my son is 14, and he eats like a growing boy, so this would be great for leftovers. He is a protein guy 🙂 Now that I found out the turkey can fit…my next question is, do I double the recipe? And I see that you said to put it on low for 8 hours, and this is for the 3 pounder. So your suggestion is for me to cook it on high for 4 hours and then check to see if it is cooked, and then to warm it for additional couple of hours til it crisps. If the temperature does not reach 165 after 4 hours, should I cook it at low or “warm” for additional 4 hours instead of two? I appreciate all of your advices, I’ve just started to use the cockpot and am nervous when it comes to making meat. However, I’ve made 5 crockpot recipes and they came out fabulous, much to my surprise! So was my son 🙂 Thank you for your great advice!!! Did you rub any of your spics under the skin? Or did you just put on top of the skin? I’m making a small thanksgiving dinner for my husband and I on Wednesday since he is working on the holiday and can’t join our families on thanksgiving. 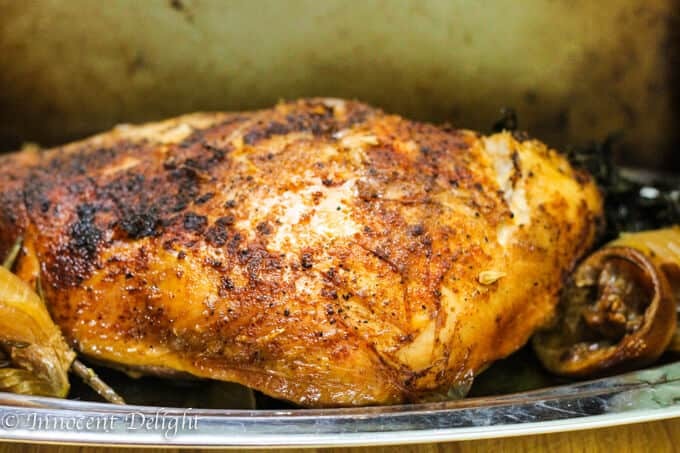 This recipe looks great but some of the recipes I have been looking at rub the spices under the skin and over the skin. I just wondered what you did and if it would be worth rubbing under the skin also? Thanks so much! I’m very sorry Kristy I didn’t get back to you earlier. I thought I did and now I looked at my comments and I see that I haven’t replied to you. I actually just sprinkled all the spices on the top of the breast. I litteraly prepared it in 5 minutes before leaving for work and did not have time to rub it under the skin. I’m pretty sure that rubbing spices under the skin will make this turkey even better, so by all means do it. Rub it under and sprinkle more on top. I hope it will come out great. Hi, I want to use this for my thanksgiving turkey. It weighs about 9 lbs. This is my first time cooking a thanksgiving turkey and i’m not sure how much ingredients I have to put in the crock pot. Can you please help me? Hi Tiffany, my turkey breast was just one and its weight was about 3 pounds. 9 pounds seems a little big for the crockpot. Is this just the breast (double breasts) or the whole bird? I suggest you try to fit it in first before you cook it. But for sure I would double the ingridients. 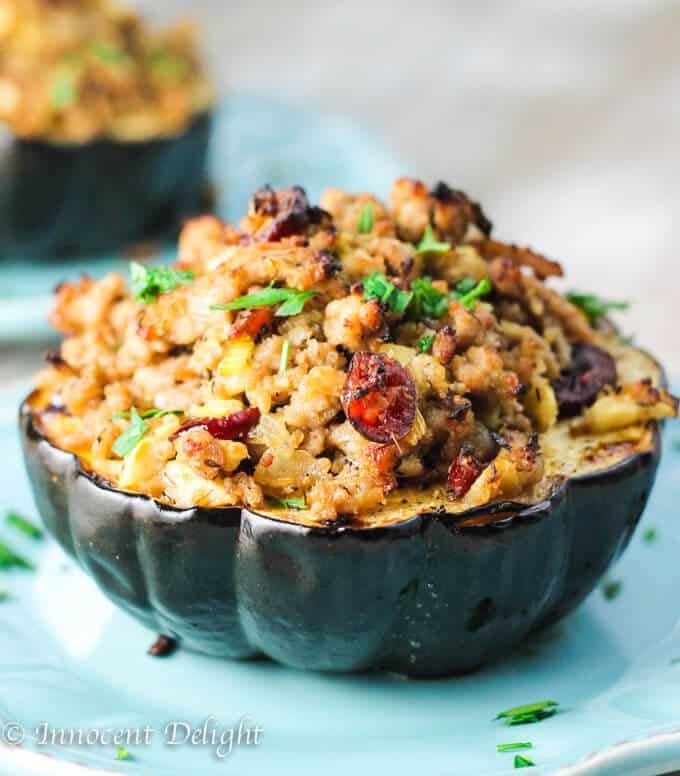 This recipe looks fantastic and a great way to free up to the oven for the side dishes! 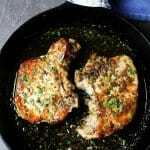 Does the meat become so tender that it shreds or are you able to slice it up? Thanks in advance! Hi Kanishka, the meat does come out very tender so slicing may be actually a challenge. 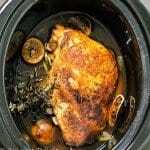 you don’t need to add chicken stock or wine or water to the crockpot ?? Merry Christmas! Made this today for our Christmas dinner. It came out perfectly. I added carrots and parsnips so I can make soup from the carcass and juices. Thanks for such a super recipe and great instructions. Amanda, thanks so much for letting me know that it came out perfectly for you. I hope you had wonderful Christmas. i think that you are cooking a half turkey breast, like you would a half of the chicken breast. Turkey breasts are usually sold whole. Also you said you cooked yours on warm, was this the entire time. Hi Jennifer. You’re right it was a half breast but that’s the only type I have ever found. I didn’t even know that you can buy whole turkey breast. Anyways, I cooked it on low for 8 hours and then left it on warm as we were still at work when the turkey was cooking. Making this for the second time tomorrow! Such a great, easy recipe! I made this yesterday and the smells all day in the house were amazing and the turkey came out so tender. The gravy, however, had some bitter undertones. I tried to offset it by adding some brown sugar and salt but I couldn’t remedy it. I wonder if the bitterness came from the lemon rinds? Has this ever happened to you? Hey Sue, it actually did happened to me once. I guess it depends on the lemons. For the next time, do not put any lemons and once your turkey is done and you think that your gravy could use some tang, add some lemon juice at the end. Thanks for letting me know! Hi! Coming from a college student who’s spending thanksgiving by herself and whose never cooked a turkey before, I’m really excited to try out this recipe! Hi Emily, I hope it will work out well for you! Happy Thanksgiving. Hi there! I just came across this on pinterest and I am in love. I’m going to attempt this for Thanksgiving this week – however, I had a question. Have you tried adding carrots under the turkey breast as well? I wanted to make a veggie of some sort and I was wondering if this would be possible. Hi! I just got back from the store with all the ingredients to try this turkey recipe tomorrow. I just realized I got a rolled, boneless turkey breast. Do you think it will turn out the same? How would you adjust cooking time? I can’t wait to try it. Hi Karen, I think you should be fine without the bone. Keep in mind that your meat will be very soft and falling apart. Slow cooker gives the meat a lot of moisture. I think it’s delicious, but I guess it’s the matter of taste. You can try the temperature of the meat after 6-7 hours on low or 2,5 – 3 hours on hight. Remember that the inside temperature should be 165 F. It may happen that your meat will be done earlier. Also I would skip the lemons, as the sauce turned out a little bitter few times for me. I think it probably depends on lemons, but to be on a safe side, skip the lemons and adjust seasoning when making the gravy. Good luck and Happy Thanksgiving! Hi, Edyta. I really want to try this slow cooker turkey for the Christmas holiday; but what size slow cooker do you own? Mine is three-and-a-half quarts … too small! But maybe it is time for me to upgrade (and I can still use my older cooker for side dishes!) If you are able to edit this page, you might want to mention the size of your slow cooker, for the sake of us old-timers who may only own of those cookers that are too small. I use the big one. I think mine will be 6.5 Qt. But if your meat fits the smaller one, that’s fine. This is by far the best turkey I’ve ever eaten. So moist and delicious. I did bake in the oven since it wouldn’t fit in my crock pot, but the flavors were spectacular. Will do this from now on!! I enjoy this recipe for the turkey but I have learned not to add the lemons. They really do ruin the gravy. Can u recommend a paleo friendly way to make the gravy (dairy-free and no corn starch)? Hi Theresa, the best way to make paleo friendly gravy is to use root vegetables. Place carrots, parsnip, celery, potato and onion at the bottom of the slow cooker. Skip the lemon. Once your turkey is cooked you can puree your vegetables to make gravy. I hope it helps. Hi! I have an odd question. I really love your recipe and I have made it last year in the slow cooker. I was wanting to do it in the oven this year, as I have the perfect pan with a rack for a turkey that I wanted to use. I was wondering if you could tell me how to adapt this for the oven? Hi Madison, thanks for using my recipe. I have not made this turkey breast in the oven, but I will look into it and adjust the recipe for you. Please send me a message through my Contact page and I will reply to your email.